It is no secret how much I love cupcakes. 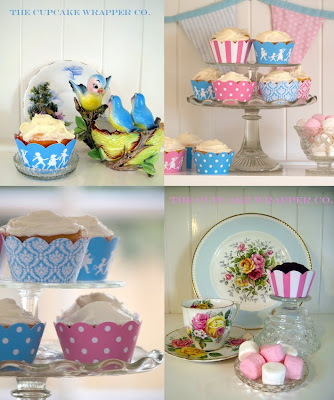 I have posted before about cupcake sets from Wu&Wu and Meri Meri which are sold in my shop. This time I found lovely cupcake wrappers from The Cupcake Wrapper Co.
Kat and Nat, two Mums from Melbourne, Australia who, like many of us where looking for that job to excite and challenge us but still give us time with for our families, started the company last September. 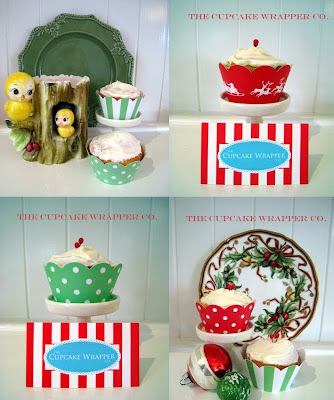 Their wrappers, Australian designed and made, stylish and eco-packaged can make any cupcake look fabulous. They are made from a thick & sturdy paper card stock and are laminated on both sides to prevent discoloration from cupcakes and icing. I love their designs, the line they just lounged for Christmas is fun and retro, I'd use them for tea parties and birthdays too ( I am huge fan of polka dots). What I like the most is the styling of their photographs. They seem to have the loveliest collection of antique floral plates and teacups, glass accessories and vintage kitsch porcelain figures. You can buy their wrappers from their Etsy shop and visit their Blog to learn about new products. KLEIMAN QUERIDA... gracias por tu blog. No sabes cuánto lo disfruto... y me insipira siempre. No cabe duda que lo nuestro es lo que hacemos :) Un beso. Gracias por leer mi blog, por dejar comentarios y sobretodo gracias porque tu siempre eres tambien una gran inspiracion.